The Hidden Costs Of Raising The Medicare Age : Shots - Health News By delaying the age at which people can join Medicare, the federal government could save millions of dollars. But if 65- and 66-year-olds have to find health insurance on the open market, states, employers and individuals of all ages will end up paying a lot more. 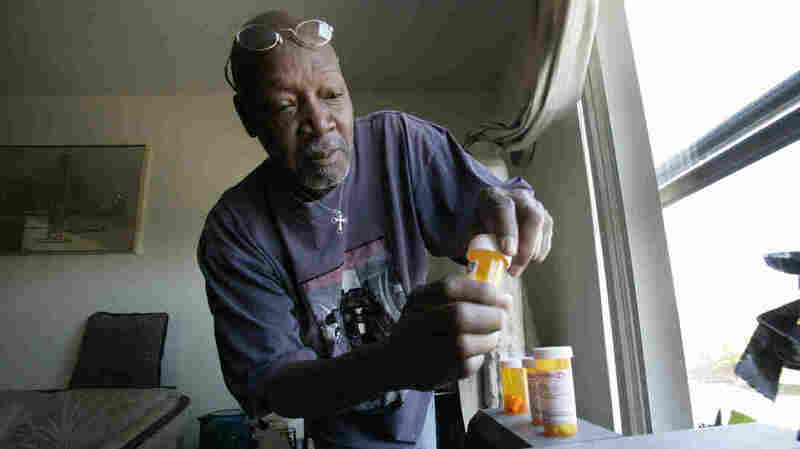 Keith Gresham, 65, lines up four medications he takes at his home in Detroit in 2011. The self-employed painter was without health insurance for about a decade and was happy to finally turn 65 last year so he could qualify for Medicare. Whenever the discussion turns to saving money in Medicare, the idea of raising the eligibility age often comes up. "I don't think you can look at entitlement reform without adjusting the age for retirement," Sen. Lindsey Graham, R-S.C., said on ABC's This Week last Sunday. "Let it float up another year or so over the next 30 years, adjust Medicare from 65 to 67." It's hardly surprising that the idea keeps finding its way into the conversation. That same increase is already being phased in for Social Security. Even President Obama reportedly had the idea on the table during his informal negotiations with House Speaker John Boehner during the summer of 2011. And why not? "It's clear that it would reduce federal spending and it can do so in a very immediate sense, depending on how it's phased in," says Tricia Neuman, senior vice president of the nonpartisan Kaiser Family Foundation and director of its Medicare Policy Project. "However, while federal spending will go down, costs to others will go up. In fact, total spending will rise." How's that? Like everything in health care, it's a little bit complicated. But the bottom line is that if you lower costs for one group, you almost always raise them for another. Let's focus on those 65- and 66-year-olds. In Medicare, they're currently the youngest and healthiest people. So by delaying their entry into the program, says Neuman, you raise costs for everyone else already there. The result would be that "people on Medicare pay higher premiums," she said. "That's because you're taking the healthiest people out of the Medicare risk pool, leaving sicker people to pay higher premiums." At the same time, those same 65- and 66-year-olds would be the oldest and, likely, among the sickest people remaining in the insurance pools of the working-age population, particularly in the new health insurance exchanges. "That means that they are raising the average risk of people in the exchanges, so that younger people in the exchanges, everybody in the exchanges, will see premiums rise, but especially so for those who are younger," Neuman says. That's because under the federal health law for the first time, insurance companies won't be able to charge older people many times more than younger people for the same insurance coverage. Topher Spiro, head of health policy at the liberal think tank Center for American Progress, says it's one more reason not to change Medicare's eligibility age, at least not right now. "We think it's the absolute wrong approach when you're first implementing health care reform," Spiro said. To be clear, raising Medicare's eligibility age would save money for the half-trillion-dollar-a-year Medicare program — and for the federal government as a whole. The Congressional Budget Office estimates that Medicare spending would drop by about 5 percent a year. And at the same time, federal tax revenues would increase slightly because some of those 65- and 66-year-olds would remain in the workforce and continue to pay taxes. But overall, according to a separate study done by the Kaiser Family Foundation, the savings to the federal government would be more than offset by additional costs to states, individuals and employers — about $1 billion more in 2014 alone. "This is a very good example of how something that seems very straightforward in terms of reducing federal spending actually is a very direct way of shifting costs to other payers," Neuman says. And how nothing in health care is ever as straightforward as it might seem.